It has been EuroBasket Women drama all the way in Group B with qualification twists and turns after each game. Belgium put their opening day defeat behind them to outscore Romania (70-63) in the first game of day 2. Emma Meesseman led the way for Belgium with 20 points and 11 rebounds. However she had to leave the court for four minutes during a critical stage of the match due to foul problems. Belgium were leading (57-52) when Meesseman departed. Romania took full advantage and scored 6 points in a row to regain the lead (58-57) with just under four minutes to go. The two teams then traded a few baskets (61-61) to set up an explosive show-down. Belgium stroke first with the youthful exuberance of Emmanuella Mayombo (left). Meesseman who had returned to action scored her last points of the game with just over a minute to play to give her side a 4-point lead. Messeman fouled out with 48 seconds to play in blocking Maria Pascalau. Yet her team-mates did not panic and Romina Ciappina connected from the land of many to set up the victory. Romania had a couple of long shots that failed to hit the target and with the games in the last seconds Annemarie Parau fouled E. Mayombo. 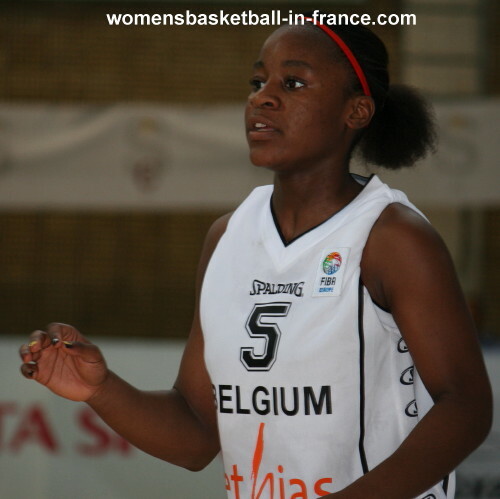 Mayombo scored both free throws for Belgium to win by 7 points (70-63). With the way the group is turning out every point has become important. The Belgium head coach Arvid Diels summed up his relief: "I'm very happy because this is probably the most important victory for Belgian basketball in our recent history. Before this game we are the only team without victory and we desperately wanted to win." Germany went to the top of Group B after beating the hosts Italy (78-57). Anne Breitreiner (left) was on fire and finished with 31 points while Romy Bär chipped in 21 points and added 8 more rebounds to her count. Italy were never able to settle and they found themselves on the receiving end of a 10-2 run by their guests to trail (11-19) with just over six minutes played. The Italians managed to reduce the deficit to a single point (21-22) by the end of the first quarter. Italy briefly edged in front at the start of the second quarter. But once Breitreiner levelled the score (26-26) midway through the quarter, Italy were already beaten. Germany took full advantage scoring 14 unanswered points including back to back treys from Breitreiner as they took control of the match for good. Germany went into the locker room ahead (42-33). Italy were unable to stop Breitreiner and Bär as they fell further behind. Germany went into the final quarter leading by 15 points and finished winning by 21 points. 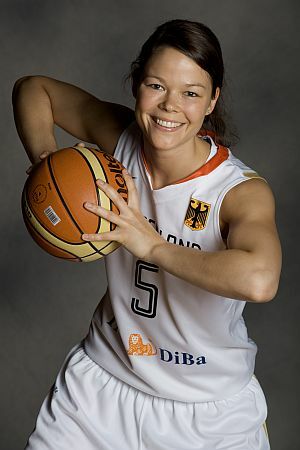 This victory put Germany on top of EuroBasket Women AQT Group B. The Additional Qualification Tournament in Taranto is wide open because all the teams have dropped at least one game during the first three days. At the moment Germany with two victories are on top of the group.